Just Cooking | Terms of Sale. Please read carefully before booking..
By placing an order or booking a class you are offering to purchase a product on and subject to the following terms and conditions. All orders are subject to availability and confirmation of the order price. In order to book with Just Cooking you must be over 18 years of age and possess a valid credit or debit card issued by a bank acceptable to us. If your order is accepted we will inform you by email and we will confirm the identity of the party which you have contracted with. When placing an order you undertake that all details you provide to us are true and accurate, that you are an authorized user of the credit or debit card used to place your order and that there are sufficient funds to cover the cost of the goods. When you place an order via our website booking system you will receive an acknowledgement e-mail confirming receipt of your order: this email will only be an acknowledgement and will not constitute acceptance of your order. Upon receiving your order we carry out a standard authorization check on your payment card to ensure there are sufficient funds to fulfill the transaction. Your card will be debited upon authorisation being received. The monies received upon the debiting of your card shall be treated as a deposit against the value of the goods you wish to purchase. The voucher must be used within 12 months of purchase. The voucher cannot not be used for any service/product other than the one stated on the voucher. The voucher has no cash value and no refunds are given on vouchers. Courses can require a deposit of at least 50%. 21 days notice must be given for full refund on cancellations. If notice of cancellation is less than 21 days the deposit will be forfeited or the deposit can be forwarded to an alternative class. The remaining balance of the class cost must be paid at the start of the class. If you are unable to attend a class you are welcome to send a friend in your place. Subject to demand the course schedule may vary or change. If at any stage Just Cooking has to cancel a course due to minimum numbers not being met, a full refund of monies paid or an alternative date will be given. Due to the cost of running the course, no refunds can be made for classes that are missed. 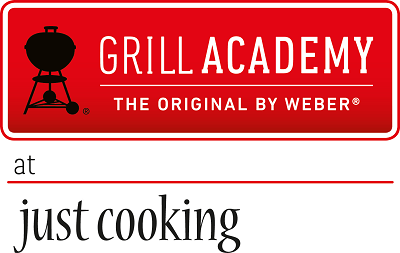 This website is owned and operated by Just Cooking. We are registered in Ireland under registration number , 326378 and our registered office is at Public Office Address: Companies Registration Office, Parnell House, 14 Parnell Square, Dublin 1. Our principal office and place of business is at Killahane, Firies, Killarney, Co Kerry. You can contact us by writing to the business address given above, by email to info@justcooking.ie or by telephone on 066 979 3660. *	Allow users to unsubscribe by using the link at the bottom of each email.